The most important aspect of Chevrolet’s next-generation Volt will be its overall efficiency and range. 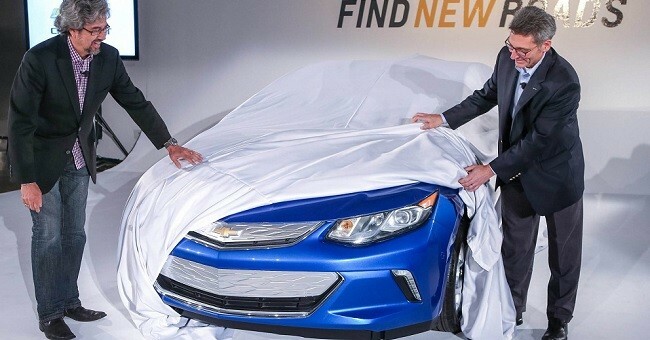 General Motors North America Vice President, Mark Reuss, has already proclaimed the new extended-range EV will have improved fuel economy and efficiency, and a new report from Hybrid Cars supports this little piece of info. A filing with SAE International indicates the next-generation Volt and its new Voltec powertrain will have a 12 percent boost in overall range. That would take the combined gas and electric range from around 380 miles to 425 miles. There’s no word on how much all-electric range is improved by, however GM executive director, transmission and electrification, Larry Nitz, said that was one of the main aspects of the car consumers wanted improved. “Greater range (particularly in EV mode), fuel efficiency, and power were the top three requests from owners of 2011-2013 Volt models” Nitz said. The SAE report says the 2016 Volt will also benefit from a 12 percent boost in energy efficiency, not just in overall range. It’s still unclear if this means a 12 percent jump in combined fuel economy for the new model (which would take it from 37 to 41.1 mpg) or a 12 percent jump in EV only mode, which would give the new car over 43 miles of electric range, Hybrid Cars says. One thing is certain, when Chevrolet pulls the wraps all the way off the 2016 Volt in Detroit in January, it will be lighter, quieter, more refined and more efficient than the current car, the only question is by how much? We’ll have all the details in January, so stay tuned. terrible looking. S. Korean and international Cruze v.2 has a better looking nose for sure. Volt got the best front design of the bunch! than any Prius other than long , long hauls which are not how nearly 95% of our cars are used. care how Volt works – they want a gas efficient, yet sporty car that can kiss gas stations goodbye. Volt does. Sell 100,000+ Volts per year and we can count on GM making them for years to come. I just hope they do a better job of marketing this. Leave much of the technical bit aside and just show the average person what this car can do for them on a daily basis. All people understand plugging in once a night and filling up one every 6 months. The real factor will be where will gas prices be when it comes out. If they are up it will help if they are down not so much. Also gas prices also will play a part here. If gas is cheap it matters little what you have or what it is made of. If gas spikes again as it will at some point it will help sell that 1-2 MPG difference. I expect the 2016 Volt to reach (and surpass) the desired 50 miles of EV range, and maybe even 50 MPG for the new range extender. The new 5T50 drive unit is a complete package that can fit other GM platforms, allowing more EREVs in GM line-up, especially for a CUV, a sports car and a pickup truck, which are the meat-and-potatoes in GM’s annual sales. More EREVS will lower the development cost and sale prices, and allow GM to continue to electrify its lineup up to the new CT6 flagship. All the range improvement and price reduction possible will help. I sure the 12% number is low, as that sounds like a small step forward, not the leap it needs. Also, they must get a CUV going on this drive system. That is a big market that will continue to grow. Something much like the MPV5 concept of a couple of years ago. The pickup is the last one to consider. Ultimately, people buy pickups for capability, not for fuel economy.